As I was creating the background for this card I thought that maybe I had let it sit for too long (30 minutes) before attempting the technique. In retrospect, I think two things happened. First, I did overheat the Heat & Stick Powder a little in a few spots and that caused the glitter to not stick as well as it should. If I had just left it alone after adding the glitter and put on a spray fixative, the background would have been a normal, glittered card...end of story. At this point, I need to mention that i am using the new Orange Ultrafine Stampin' Glitter from the Holiday Mini Catalog. But the purpose of the experiment was to see what results I would get if I tried to burnish the glitter. Therefore, second thing I discovered is that Heat & Stick powder is somewhat "rough" in texture. Even though I managed to burnish the glitter, it took on the texture of the H&S powder. In other words, if you are wanting a glitter card that isn't too messy to give, then I think you will be fairly satisfied with the results. If however, you desire the "foil" look of the previous card, then you will probably be disappointed. Now don't misunderstand...the background on this card is still really pretty, but it just isn't the big WOW that you get when you burnish glitter into the die cut multi-purpose adhesive sheets. It looks more like I used glittery embossing powder and then heat embossed the chevrons. I guess I should tell you just a bit of how I finished off this card. I cut a banner from some Modern Medley DSP and added a piece of Witches' Brew washi tape. Then I used a leftover rosette from the Halloween Banner Accessory Kit. (NOTE: I cut it in half lengthwise to make it smaller.) I used markers (Old Olive, Perfect Plum, & Basic Black) to color the Trick or Treat stamp from the "Tags 4 You" stamp set and punched it out with the Label Bracket Punch. I used the burnished glitter techniqe from this post to create a border piece for the sentiment. Finally, I stamped the tickets from the Halloween Bash set with Jet Black StazOn ink on Pumpkin Pie, Old Olive, and Perfect Plum cardstock and punched them out with the coordinating Ticket punch. Here's the video I mentioned earlier. I tried to keep it a little shorter this time. I hope you have a wonderful weekend! I can't believe it's time for another Artisan Design Team blog hop. This week we are featuring the projects that were posted on the Stampin' Up! Facebook page last Friday. This gives us the opportunity to give you a closer look and tell you a little more about how we did things. When we design our projects for the Facebook post, we are only able to write a few lines about how they were made. Now we can take our time and really give you the details. Unlike every other week, this time we already know what everyone will be blogging about. There's some pretty amazing stuff this week, so be sure to hop on through to get a closer looks at everything! My project today features the burnished glitter technique. I wish you could see the card for real because the picture just doesn't do it justice. Even my husband (who never comments on anything I make) thought this card is "really cool". This isn't a new technique. I heard about it a few years ago, but I never really got around to trying out until now. Basically, I die cut a Multipurpose Adhesive Sheet using the Autumn Accents Bigz die. Then I carefully peeled away one side of the backing and adhered the sticky part to the card front. Once you have everything placed just the way you want it, then remove the other piece of backing and coat all of the die cut adhesive pieces with the orange glitter. This technique doesn't work with just any glitter...it has to be the ultra-fine glitter like that in the holiday mini catalog. After you have everything coated, tap off the excess and put it back into the container. Next, pat the glitter into the adhesive and then begin to carefully rub the glitter until it is smooth. You will know when you have done it right because it will take on a smooth, foil-like appearance. You are probably thinking right about now that this sounds a little messy. You are absolutely right, it is messy, but it is a fun kind of messy. LOL! I used one of those disposable dry dusting cloths (the cheap version) to clean up most of the mess. Then I used one of those sticky lint rollers to pick up any remaining glitter. If you are careful you can actually roll it over the top of your card to pick up any stray glitter. Stamp your background first and give it plenty of time to dry. You might want to even go over it with an Embossing Buddy just to make sure it isn't still tacky. When I made this card the background was an afterthought, so after I stamped it I used a damp baby wipe to wipe off any ink from the foiled leaves. I was shocked at how well this worked, but I think I would prefer the other method. You might want to spray a fixative over the card before moving on. I used some aerosol hairspray. The rest of the card is pretty simple. I frayed the edges of some burlap ribbon, tied on some linen thread. There are actually two buttons on this card. I placed a Pumpkin Pie button inside of a Naturals designer button before attaching them to the card front. I will put the supply list at the bottom of the post if you would like to know exactly what products I used. Now be sure to head on over to see what Erica Cerwin and the rest of the Artisan Design Team have in store for you! I can't believe it's time for another blog hop by the official Stampin' Up! 2013-14 Artisan Design Team. Each week I am truly amazed to see what all of these super talented ladies have created. I feel so blessed to be a part of this incredible team. For today's project I thought I would share a Trick-or-Treat themed project. This would also be a great Thanksgiving favor. Everyone already knows that the Pumpkin Pie Goodie Gear Simply Created Kit is a great value at on $4.95 (US). They are already cute the way the package shows them, but I thought it would be fun to step them up a little...well...OK...a lot! Today's project starts with the cello bags, die cut Kraft tags and Whisper White banners from the kit, but that is where it ends. Save that Bermuda Bay Baker's Twine and those stickers for another project because to make these treat bags you won't need them. What you will need is some Pumpkin Pie & Old Olive card stock, linen thread, Woodgrain stamp, Fabulous Phrases stamp set, Oh, Hello stamp set, an Old Olive marker, Crumb Cake & Early Espresso ink pads, a clothes pin, some jute twine, some Burlap Ribbon, the Boho Blossoms and Small Oval punches, and some Witches' Brew Designer Washi Tape. You can pick-up almost everything you need right here in my online store. For all of you visual learners, there is a video tutorial below. The video also includes this little bonus project at the end. I used the left-over stickers from the kit to cover little bottles of bubbles. I teach preschool crafts at church and I wanted a fun Halloween alternative favor to give to my little ones. You can purchase these little bottles (or something similar) at your local discount or craft store in either the Halloween section or wedding favor section. I cut the sticker strips into 3-1/8" strips, stamped a greeting from the Blessings From Heaven stamp set with Jet Black StazOn Ink, and then wrapped them around the bottles. I had a little difficulty making the stickers adhere to the bottles, so I overlapped the ends slightly. I also used a 1/2" circle punch to cut circles for the tops of the bottles. I hope you have enjoyed today's projects. Now be sure to head on over to see what Erica Cerwin and the rest of the Artisan Design Team have in store for you! Thanks for joining us again for the 2013-14 Artisan Design Team's weekly blog hop. It is such an honor to be creating alongside these talented ladies. Their creativity never ceases to amaze me. So, just as a recap...each month Stampin' Up! sends each member of the Design Team a huge box of goodies for us to feature in our weekly blog hop. The new Chevron Border punch wasn't exactly at the top of my wish list, but once I got my hands on it, I couldn't put it down. I LOVE IT! Who would have thought that you could make an interlocking lattice border with the Chevron Border Punch? I am still amazed at how simple this is to do and it was my idea. LOL! But to try and explain it without showing you...well that would just be too difficult...so I did a quick video to show you how. The video is at the bottom of this post, so be sure to check it out. But first, let me give you a few more details about this card. Start with a standard Very Vanilla Card Base and layer on some Modern Day DSP. It is difficult to tell from the pictures, but I paper-pleated the bottom portion of the card. To create the pleats, score the DSP at 1", 1.75", 2", 2.75", 3", 3.75", 4", 4.75" continuing the pattern until you reach the end of the 12" strip. Then accordian fold it and place it along the bottom edge of the card. Then add the lattice border strip. Stamp the greeting with the "Forever With You" stamp set using Jet Black StazOn ink and cut it out with the coordinating Window Frames Framelit Die. Cut two additional pieces out of Daffodil Delight cardstock and layer it behind the greeting. Create a small flower using a punch from the Itty Bitty Shapes and add a small pearl for the flower center. That's all there is to it. I know you are going to have fun with this new technique, so give it a try and let me know what you think. Now, here is the video tutorial. After you have finished watching, be sure to head on over to see the amazing projects that the other Artisans have in store for you. 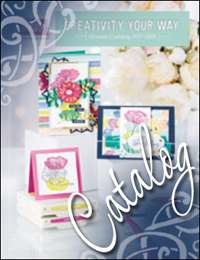 Welcome to the first official Artisan Wednesday WOW Blog Hop for the 2013-14 Stampin' Up! Artisan Design Team. Each Wednesday we will be sharing a project made primarily with the contents of a monthly box of goodies we receive from Stampin' Up! This month was a little bit of a challenge for me. I like to think that I do things "outside the box", so now that I have create from inside the box, I have to do things a little differently than normal. We will be hopping in the same order every week, so depending on where you begin you should arrive from Cindy Schuster's blog, Nutmeg Creations. Then when you leave here, you will head on over to visit Erica Cerwin at Pink Buckeroo Designs. As I write my posts each week I have no idea what they will be sharing, so I will be just as surprised and amazed as you are. Here is my project for this week's blog hop. One of my favorite products from the Holiday Mini Catalog are the mini muslin bags. I just couldn't wait to get my hands on them...then when I finally did, my mind went blank. Seriously! So I took a deep breath and decided to sacrifice one bag for the sake of the greater good. I tried stamping with regular ink...nope, that didn't do anything for me. Then I tried stamping them with VersaMark ink and embossing with clear ink for the resist technique...that was a minor disaster. Finally, I pulled out my acrylic paints and a sponge dauber...SUCCESS! I know that some of you will look at this bag and know exactly how it's made, but others are visual learners, so I put together a video tutorial on how I stamped the bag. Scroll down to the end of this post if you want to watch it. I am the type of person who likes to explain the process, so if that drives you nuts, then just watch the beginning and the end and skip over the middle. What I didn't do is make a video for the tag, so let me just quickly tell you what was involved. I stamped "best friend" from the Label Love stamp set twice on Very Vanilla cardstock. I used the Artisan Label Punch to punch out the one stamped in Old Olive. I hand-trimmed the center portion of the one stamped in Pumpkin Pie ink. To create the base of the tag I stamped the tag from the Chalk Talk stamp set with Daffodil Delight ink and carefully trimmed it out with scissors. I cut the tag base using the Chalk Talk Framelits and Old Olive cardstock. The butterfly was cut from Pumpkin Pie cardstock with the Beautiful Wings Embosslits. Here's the video...when you are finished watching, be sure to continue with today's blog hop.